Love is the real magic around us. It is the purest and selfless feeling which brings positivity to one’s life and thus makes the society a better place to live. Love is often the most misinterpreted feeling also! People often wrongly consider infatuation, attraction, passion, possession and other such feelings as love; which it is not. But, we are not talking about any such misunderstanding(s). We are referring pure love. We (human beings) love to explore love stories through various media be it a book, novella, movie, TV serial or similar. 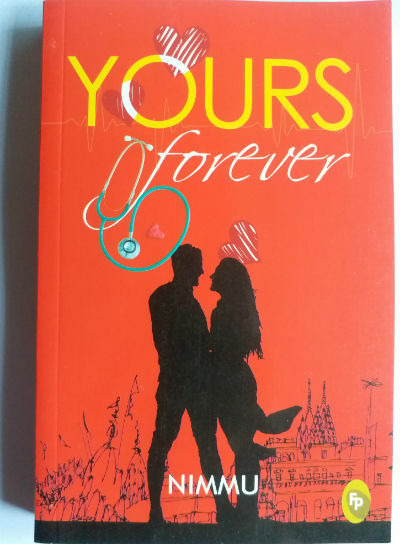 Recently we got a chance to read Yours Forever, a book by Nimmu. As the name suggests, it explores a love story. Actually, it explores many love stories in a simple and effective manner with some tragic incidents. Let us talk about this book in more detail. The book was a part of a package provided by Fingerprint Publishing in exchange for genuine and unbiased book reviews, and as always the review is uninfluenced, genuine and unbiased. The cheerful red background makes the cover attractive. The black illustration of a couple stand facing each other adds to the positivity. At the same time, the hearts in dark red fails to make a strong impression as they (as there are two hearts) dissolve in the background and comparatively hard to notice. The font colors are chosen wisely where yellow, and white makes a good impression but the stethoscope color could have been a little different. In fact, the designer(s) tried to weave most of the components of the story in the cover page. So, comparatively a good cover page which could have been better. Sneha is a doctor who has recently joined the hospital as a resident doctor. Actually, those who are familiar with the medical world are familiar with the term resident doctor. After completing the studies, the doctors need to pursue practical knowledge by assisting under experienced ones. A kind of apprentice period. It is one of the most important periods in a doctor’s life where he/she explores the practical usage of his/her knowledge and earns the real experience and learns a lot. And yes, the experience is the best teacher in this field also :). Sneha lives with her grandmother in an apartment where there are many other resident doctors also live. Today is her first day to the hospital and she feels joyous and nervous both. Actually, many of her classmates are to join her in the same hospital, so it will not be a totally strange environment for her. But, the first day of job gives anyone goosebumps :). After getting blessings from her grandmother, when she was climbing down the stairs she bumped into a person with crutches who hold some books. Their collision makes the book fall from the hands of the person. After apologizing when she tried helping the person she got an unexpected response, which made her upset and she did something which she otherwise possibly not do. At the hospital, she was surprised to know that the person she had a kind of quarrel in the morning is no one else but Dr. Shiva! He is one of the most talented doctors from the city and the team of the resident doctors need to work under him. So, in corporate terms, he is their immediate boss. While Shiva is a genuine and intelligent doctor, some recent mishaps in his life made his life tragic. Actually, he was met with an accident when driving his wife and daughter in a car. The accident made him wear crutches, but, it is not the biggest loss for him. It is his wife’s death! Actually, today he is attending the hospital after a long break and trying to get into the rhythm of life. The things are fine to him professionally, but personally, he has some mood swings due to this tragic incidents. How the story moves ahead from this point is better to explore by reading this book. Over the course, you will meet Rathna (Sneha’s grandmother), Raji (Shiva’s mother), Mithra (Shiva’s daughter) among others. We also meet Latha, Nikhil, Anjali and others who studied medicines together with Sneha and are her colleagues now. The book is nicely written where the characters develop strongly and slowly yet they don’t fail to make the first impression. Nimmu tried exploring the medical world quite convincingly. Actually, it is not as easy as it sounds. On one side you need to use the medical terminology and some technical stuff related to the field quite flawlessly and at the other, you need to make sure that it doesn’t remain a jargon for the readers. Balancing these things is like walking on a tightrope which the author has done nicely. Of course, she has done her research to make the things convincing, and yet the book never becomes boring, and I consider this as an achievement for the author. The other thing I like in the book is the way the characters are developed. They are strong in their own sense and yet they are fragile; that makes them human. A doctor is also a human being like all of us and while working in his/her field he/she needs to the emotions away. But, eventually, he/she feel the same things. If they get emotional when attending the patient’s brutal injuries, they cannot treat them objectively, which is a “must” requirement. And, when reacting with them during counseling or following up, they need to be polite and emotional as well. It is quite a challenging job for them. And, of course, for the author also, to make the things convincing, there is a need to add scenes where she can show these attributes. Nimmu did it nicely. A doctor also lives in the same society and has a similar family bond and responsibilities also. They don’t keep their “doctor” tag 24×7 in the life unless of course, they are attending an emergency (which can appear anytime 24×7)! In short, the personal/family life of a doctor is explored in this book effectively. The author shows empowered characters regardless of their gender. Like some pseudo-feminists, the author doesn’t delve into wrong notions of the same but explores it through strong characters. This is something many authors need to learn. Anyway, let us stick to this book only:). The middle-class upbringing, social bond, and family life are explored nicely by the author. It is rare to see the grandparent-grandchild relations being explored nicely in modern books. This book is an exception. “Sneha, you are looking so beautiful. I think I need to place a dot of kajal to your cheek to prevent someone from casting an evil eye on you.” said grandmother adjusting the bindi on her forehead. This conversation between Sneha and her grandmother seems to be taken from real life, don’t you think so? It is something we hear/witness in almost every regular household. The way Sneha’s grandmother takes care of Dr. Shiva during his illness and the way she learns the things from gossiping at the temple, (and many other such things explored in the book) will give you deja-vu feelings! We need people around us during crisis, my dear. We cannot be an island forever, can we? Look at her. one moment, she was crying and after we came to the swing she forgot everything and started smiling. I wonder why we adults are unable to do that. We carry our scars as if they are badges of honour. The author’s way of defining characters and his/her attributes is interesting. The problem with him, she thought was that he expected perfection and passion from everyone around him. But for many, that was not the case, and being a doctor or nurse was just a job they did to earn money. Hmm… life is very unfair sometimes and we never know why we go through certain things. But if we have come into this world, then we need to endure both the joy and sorrow. To avoid spoilers, all I can say is, it has almost everything you look in a romantic book, which you often witness in Bollywood movies, apart from the adultery. I like the way in which the author kept away abuses and cuss words and at the same time explored childing romance (between the colleagues of Sneha). For me, the book takes a wrong turn when a tragedy happens to Sneha. Of course, the life is not fair and it can give you a brutal shock when you expect a smooth ride. But, the incident could have been anything else. Or maybe the author has made you connect with the fictional characters emotionally, that you can feel her pain, and wish that it shouldn’t have happened. The author has her own vision for the story, but as a reader, I think the story loses the track here. The shock, getting out of the same and reuniting could have been done in another way also. It could have made the book simple and more effective read. This segment made the book a little heavy read. The author could have added a glossary as well. Overall, a nice attempt. The book tries to explore the world of real people genuine. I think the author could have re-framed some of the incidents to make the book better. The second half of the book is emotionally heavy.